I found my guest today, Dr. Joyce Benenson, through a book I read called Top Dog, recommended to me by one of my recent guests, Navy Seal, Captain Tom Chaby. 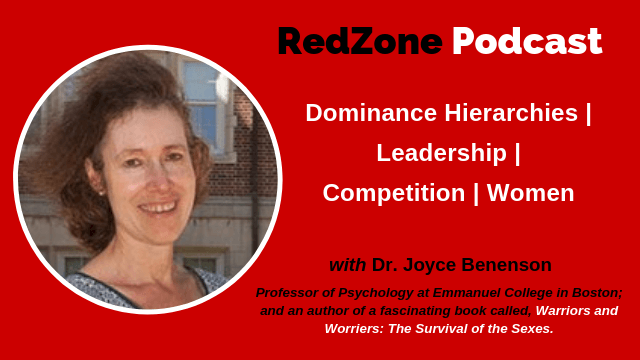 Joyce is a professor of Psychology at Emmanuel College in Boston and an Associate Member of the Human Evolutionary Biology department at Harvard University. She is an author of a fascinating book called Warriors and Worriers: The Survival of the Sexes. The book explores the evolutionary differences between men and women and how they survive through competitiveness. Drawing on an interesting array of studies and stories that explore the ways boys and men deter their enemies, while girls and women find assistants to aid them in coping with vulnerable children and elders, Benenson turns upside down the familiar wisdom that women are more sociable than men and that men are more competitive than women. As much as I love to interview guests on leadership and high performance topics on my podcast, in this interview, Joyce and I discuss what IT business leaders could learn from her studies on gender differences to get the most out of their high performance teams. I think self-awareness is the key to being a high-performance leader. You will need to draw your own conclusions from my discussion with Joyce Benenson. In an age of political correctness and non-brave communications, I love reading and listening to experts who explore topics worth considering in our political environment. As you explore your own process of developing as a leader in business and in your life, learn unique biological attributes of man and women that will help you be a better more “self-aware” leader. With this, I’d like to welcome you to my interview with Joyce Benenson. This entry was posted in Blog, podcast on January 18, 2019 by Lynn Trubits. As many of you know, I like to choose podcast topics that are at the forefront in the minds of my audience. I also like to interview leaders who inspire me. 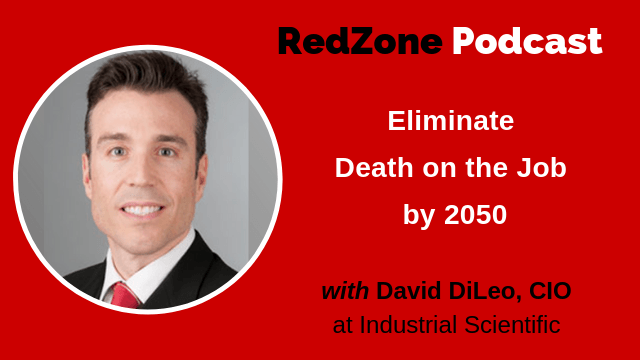 When I was looking for a new podcast guest for my show, I asked my CTO at RedZone, James Crifasi, if there was someone he knew in security that he really respected – that stood out for him as a leader in the industry. James recommended Dmitriy Ayrapetov, Executive Director of Product Management at SonicWall. 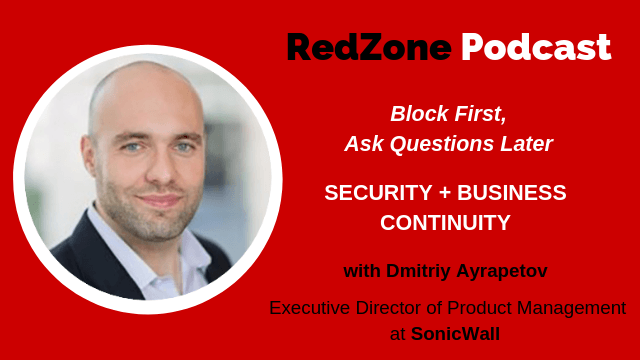 Since RedZone has been a SonicWall partner for many years, I knew Dmitriy, and I knew that he represented most of the network security products that we work with. Luckily, he agreed to come on the show. My conversation with Dmitriy ranges from philosophical to tactical and technical especially with his positions on Machine Learning and AI with security. We discuss a variety of topics including, who are his mentors and what does a product manager do at a high-profile security company like SonicWall? What would he focus on if he was a startup founder? How would I want to react if I was a customer? Are your security vendors as concerned about business continuity as you are? I think you will really appreciate Dmitriy’s philosophy for CIOs and CISOs – in particular, his thoughts on human mistakes. He believes that since human mistakes can’t be prevented, that you must realize the need for continuity of the business and be prepared for them. With this, I want to welcome you to my interview with Dmitriy Ayrapetov. This entry was posted in Blog, podcast on January 11, 2019 by Lynn Trubits. 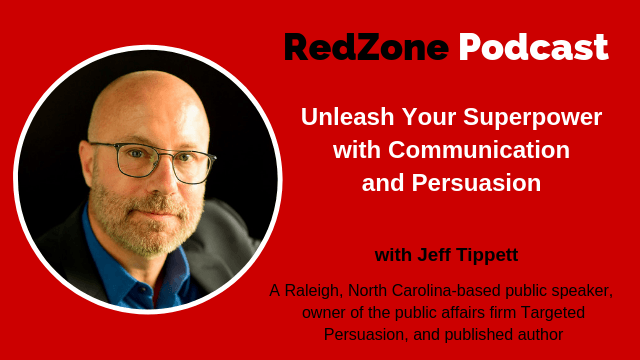 My guest today, Jeff Tippett is a Raleigh, North Carolina-based public speaker, and owner of the public affairs firm, Targeted Persuasion. Known by audiences and fans as Mr. Persuasion, Jeff Tippett is a subject matter expert in persuasive communications. Jeff has impacted thousands of lives through over 500 presentations, including keynotes and seminars. He helps people increase their effectiveness, gives them powerful tools for attaining goals and dreams, and helps them positively impact their organization – all as they learn techniques for communicating persuasively with others. The heart and soul of Jeff’s presentations is the emotional story he tells of adopting his youngest daughter from Haiti while the country’s government was collapsing. Through this near death experience of navigating civil unrest and institutional bureaucracy in a third world nation, Jeff learned valuable lessons on how to persuade others without ever manipulating. Jeff unpacks these secrets of the superpower of persuasion in every presentation. Focusing on Your Brand: We personify our brand. What is your brand saying about you? I think all of us have a responsibility to sell what we believe, sell ourselves, or sell our message. Learn how to communicate the right message – one that will get noticed. Communications in the Workplace: Millennials Are Changing the Game: Unlike previous generations, millennials’ expectations of open communications, deeper connections and authenticity are presenting a communication challenge within the workplace. The Benefits of Telling the Full Story – in Bite-sized Pieces: Shorter attention spans require short messages – not an explosion of information. You want to capture people’s attention with one word that makes them wonder what the second word is – and makes them ask you for the next level. Understanding How People Respond and Positioning Your Message: You know that people primarily respond out of emotion and not logic. Find what is emotional in the story you’re trying to tell around the information. Lead with that, work in the logic and you’ll have your best chance of persuading and moving your audience with you. Let the information all spill out – get it out of your head. Strike out everything that isn’t crucial – keep only the main words that convey your message. With this, I want to welcome you to my interview with Jeff Tippett. This entry was posted in Blog, podcast on January 4, 2019 by Lynn Trubits. 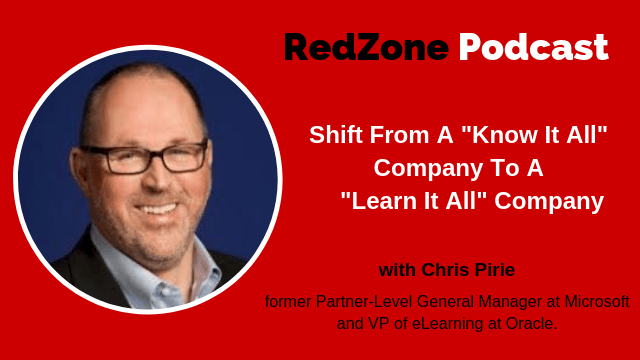 My guest this week is Chris Pirie, who until recently, was General Manager in Microsoft’s SMGSR organization. Chris led the training and readiness for all Microsoft’s sales, marketing, and technical field employees worldwide. Chris joined Microsoft in September 2004 as Senior Director of Learning Product Development, and subsequently he held global sales and marketing responsibility for Microsoft Learning, the organization’s customer training business. Chris has launched The Learning Futures Group which helps organizations rethink their Learning and Development strategy in the face of historic disruption and change in the workplace. The most agile companies win: How does learning support this strategy? Bold experiments in learning: How do organizations, companies and networks create the right environment to foster individual agility and fitness to become a better learner? Companies relaxing with learning: It’s not micromanaging the process, but creating an environment that encourages a learning culture and putting some scaffolding around it. Old frameworks and top-down modules of learning are dying: Today the expertise isn’t always at the top of the network or the organization. Things are moving too quickly for old structured processes. The power of the metaphor with learning: Giving companies the ability to take on new ideas and develop new intellectual property, like patents, by their ability to ingest new ideas from outside their four walls. Advanced research in learning using neuroscience: Offering better ways to understand how to move information into long-term memory. Discovering which social and physical conditions can accelerate or throttle the learning process. With this, I want to welcome you to my interview with Chris Pirie. This entry was posted in Blog, podcast on December 7, 2018 by Lynn Trubits.